We love "mexican" food. 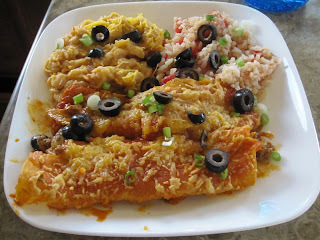 (We also love New Mexican cuisine, but that is totally different and a blog for another day!) We are often disappointed when we eat mexican and you just never know about the quality, so I decided to make it at home from now on. I'm ambitious that way sometimes! The first attempt was ok, but I need to work on the rice for sure. The beans were canned great northerns that I rinsed and smashed into a small amount of sauteed bacon and onions and added some spices. The enchiladas were good, but needed more sauce on them. I used PW's recipe for the meat and maybe if I had followed the rest of her recipe they would have been better. I did doctor her meat recipe and made some great meat pies - will blog on those later. Nope - ground meat. Click on the word "recipe" in the blog to go to PW's site and the recipe. Looks good! Reminds me of my Arturo's days from college! The food was ok, the drinks..yummy! Where there any margaritas made to go with the meal or shots of tequila? Might have been a glass of wine, but no tequila!